tommi59 wrote: 2 planets only? 2 certain ones for sure. Though it's hard to read the connotations from the slide alone, that is far too pessimistic. First, the periods used to refer to "e" and "h" (which, in the discovery papers, refer to the same signal) are different to the previous values. The period of "e" is now close to the proper period of "h", while "h" has moved to the actual period of the magnetic cycle. This doesn't actually change the planet count because they were the same object in the first place. Unlike rotation, it is physically not possible for harmonics (integer divisions) of magnetic cycles to cause an RV signal because they do not represent surface variability, so "e" cannot be activity. The same conclusion is reached by Johnson et al., and I cannot imagine why the opposite is insinuated by this slide. The rotational period of the star appears to be about the period of d (~42 d, which Motalebi et al. detect), so the first harmonic is about the period of f (~23 d, which is the signal Johnson et al. detect). However, Motalebi et al. find the RV signal to be more coherent than the activity signal and, more convincingly, the two variables are decorrelated (figure 8 ). Though their model for d is actually a combination of d and f, it remains that there would be a correlation with the activity indicators if the RV signal was activity, which is not observed. P = 10 days and P = 30 days). This suggests that the P = 22.8-day signal is not the product of spot modulation, and that it has been present and stable throughout the full time span of our observations. Though the conclusion is weaker, the evidence favours a Keplerian origin for the signal than activity. As for g, I don't even know. I guess because it's about twice the rotational period? But multiples of rotational periods don't mean anything - it is not possible for spots or plages to work like that, because then fluid dynamics would break. Stellar activity, be it rotational or basal convection, possess three important properties. They are not coherent over long timescales, they are not perfectly periodic, and they leave signals in certain spectral lines (which is how activity indicators are derived). 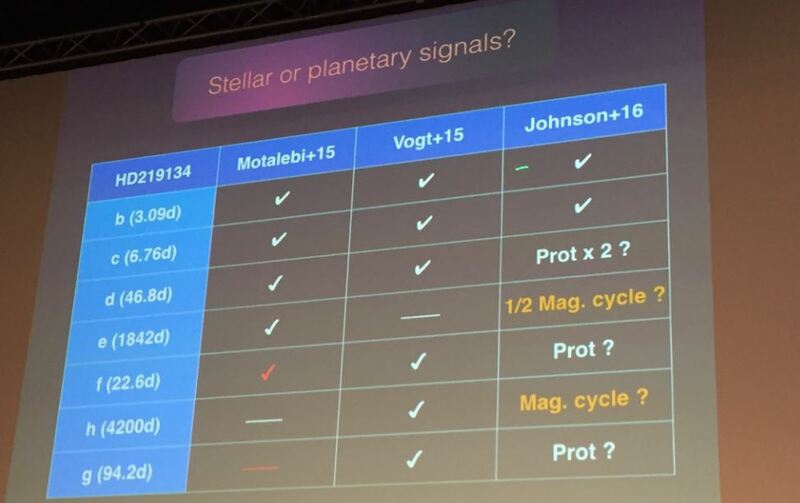 It is very unwise to dismiss planets because they happen to have periods sort of like activity without actually testing whether this is supported by activity indicators, especially when simple tools like correlations are enough to determine whether an RV signal is activity or not. But then again, all of the papers I'm citing (and this slide cites…) reach the same conclusions as what I just wrote, so I don't actually know who I should be directing this to. And there may be some missing context. Johnson et al. (2016) favour the interpretation that the 46.7-day and 2200-day signals are planetary, in which case the system consists of at least 4 planets (b, c, d, h). They don't seem to recover the signal for g from their data but they note (§4.1) that the uneven time sampling in the Keck data is problematic, they don't seem to detect c either (but transits give a fairly good indication that it does exist). Conversely, however, our work provides evidence that the 46.7 day HD 219134 d and the 2200 day HD 219134 h are likely to be actual planets; M15 and V15, respectively, had expressed some concerns about whether these RV signals could be related to stellar rotation or activity. It will be interesting to see what further data reveals about the system. The revised masses in those slides do suggest that there is a new analysis of the RVs. They don't seem to detect c either (but transits give a fairly good indication that it does exist). CHEOPS, which are both due to launch in 2018. So I hope for transit of 22.7 days planet although.At what inclination such transit would occur? 89.3 degrees? 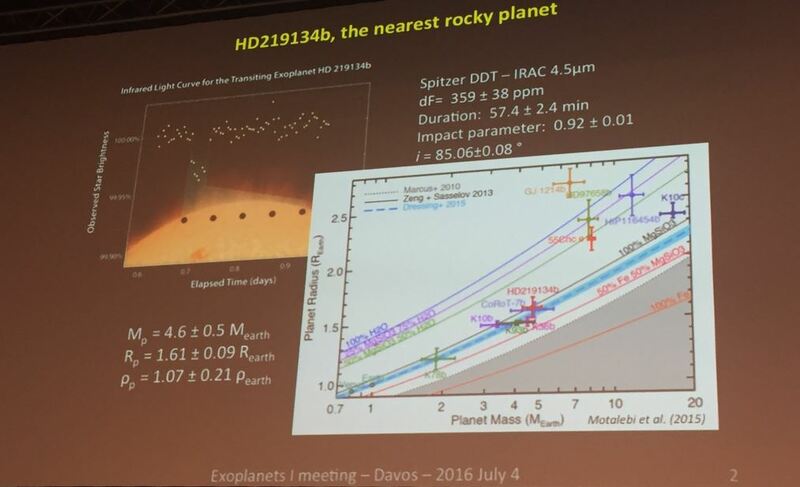 The activity level of HD 219134 is currently increasing, with the next maximum expected around late 2018. If the 22.8-day RV signal begins to appear in continuing HARPS-N observations as the activity level increases, this would be strong evidence for the stellar origin of this signal. In order to test for this possibility V15 split their dataset into three portions, and did recover the 22.8-day periodicity in all three subsets; however, they did not quote the significance level of the recovery or if the other parameters are consistent between the different subsets, preventing us from making a more detailed analysis of this issue. Additionally, high-cadence observations near the cycle maximum could potentially probe whether the 22.8 day periodicity is a harmonic of a longer rotation period. The model used in the Nature paper takes account of RHK but not sure how this relates to the SHK analysed in the Johnson et al. paper. Dorn & Heng "Secondary atmospheres on HD 219134 b and c"
The atmospheres of these planets are likely to be secondary rather than primordial. HD 219134 b likely contains a significant amount of volatiles if its rocky core has the composition inferred from stellar abundances, while HD 219134 c may be rocky. One of the papers in this Russian astrophysics journal, if I've understood it correctly through Google translate, seems to imply that the transit of HD 219134b is deeper in the UV than in the Spitzer IR. Abstract wrote: Приведены и анализируются результаты наземных наблюдений, подтверждающих открытие транзитной суперземли в системе звезды HD 219134. Признаки существования этой планеты были обнаружены ранее при анализе лучевых скоростей звезды и по наблюдению транзитов космическим телескопом «Спитцер» в инфракрасном диапазоне. В расчетное время мы зарегистрировали транзит в ближнем ультрафиолетовом диапазоне несколько раз. Измеренная глубина транзита в фильтре U системы Джонсона составляет 0.13% ± 0.027%, что глубже известной по измерениям «Спитцера.» Обсуждаются вероятные причины этой разницы. 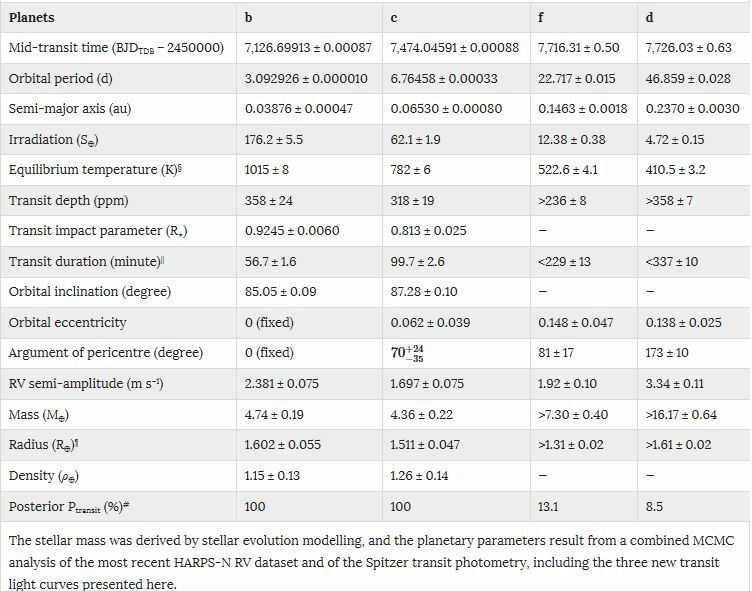 Google Translate wrote: The results of ground-based observations confirming the discovery of transit super-earth in the star system HD 219134 are presented and analyzed. Signs of the existence of this planet were discovered earlier when analyzing the radial velocities of the star and observing the transit of the space telescope "Spitzer" in the infrared range. At the estimated time, we registered transit in the near ultraviolet range several times. The measured transit depth in filter Johnson's U filter is 0.13% ± 0.027%, which is deeper than that known from Spitzer's measurements. The probable causes of this difference are discussed. Presumably this could indicate the presence of an extended (escaping?) atmosphere.